Providing Innovative Solutions and Healthier Outcomes for Kentucky Businesses Dan Cahill, Ph.D.
What matters most, each and every day, is helping our clients address one of lifeâ&#x20AC;&#x2122;s greatest challenges â&#x20AC;&#x201C; obtaining access to quality, affordable health care. HORAN works with employers across Kentucky to minimize costs and improve health. As the landscape continues to shift, HORAN will help Kentucky employers develop strategic plans that address financial concerns, plan design and effective communication with their employees. We are committed to developing innovative solutions that address health care concerns for new clients while continuing to advise our valued clients in Kentucky. For more information about how HORAN can help with your benefits strategies, please contact Dan Cahill, at 859.572.4501 or DanC@horanassoc.com. 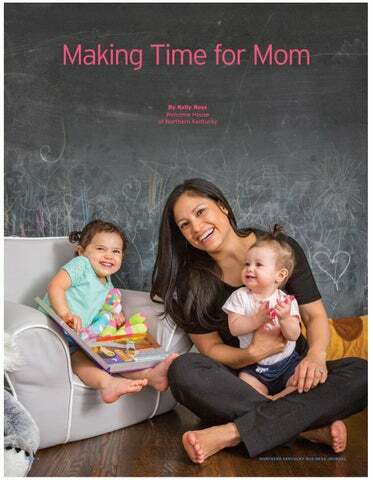 Making Time for Mom PICTURED ON THE COVER AND ABOVE: Charnella Grossman, Vice President, Senior Portfolio Manager at Fifth Third Bank, is shown last summer with her daughters, Elise, 10 months, and Kenna, 2. She has used the maternity concierge program since it began in 2017. Photos provided by Fifth Third and Best Upon Request. The NKY Chamber has partnered with .Jobs to bring a brand new job posting service to the Northern Kentucky region. This partnership introduces a new regional job board, which will drive job seeker engagement and enhance the GROW NKY initiative. This service comes at no charge to NKY Chamber members. — Imagine what our workforce would look like if every business in NKY had at least one internship/apprenticeship. Wouldn’t that be great? — We know that we can’t have strong businesses and a vibrant economy without a strong workforce. The two go hand in hand. AS I’M SURE YOU’RE AWARE, things are really happening at the NKY Chamber these days. Membership is up, attendance at events is up, and we’re leading on community efforts all around the region. The spotlight this month is on “Workforce,” and the challenges everyone faces surrounding talent growth, attraction and retention. 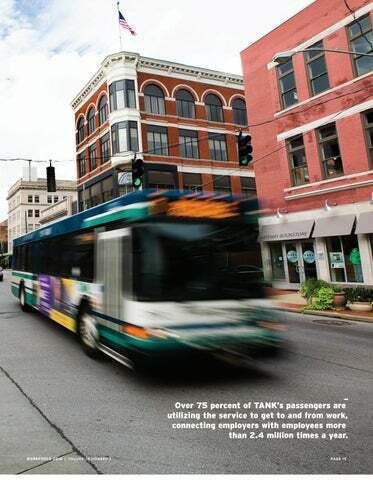 In this issue of the Business Journal, you’ll discover just some of the ways our region is addressing these challenges. It should be noted that all of our efforts are being coordinated through our GROW NKY (Growing Regional Outcomes through Workforce) initiative, and being driven by businesses, education and civic partnerships throughout the entire region. On the early childhood front, we’re talking about ways to improve the availability of quality childcare and address the maternity needs of the workforce. We’re also supporting quality pre-school for all kids and doing all we can as a community to make sure kids are ready for kindergarten. Once they’re in school, we’re talking about how we can simplify the process of connecting businesses with education, and dramatically increase the number of interns, co-ops, and experiential learning options for students. Imagine what our workforce would look like if every business in NKY had at least one internship/apprenticeship. Wouldn’t that be great? 400 W 3rd St.; Covington, KY ph: 800.827.2414 | fax: 859.431.1837 | We accept PO’s . 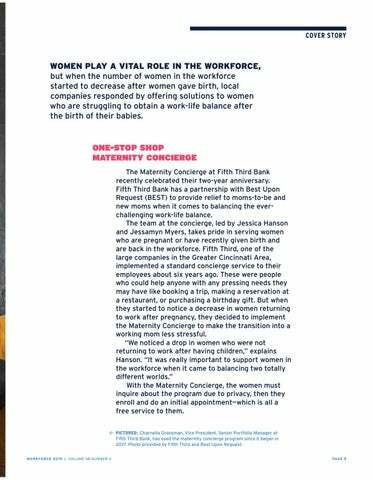 WOMEN PLAY A VITAL ROLE IN THE WORKFORCE, but when the number of women in the workforce started to decrease after women gave birth, local companies responded by offering solutions to women who are struggling to obtain a work-life balance after the birth of their babies. PICTURED: Best Upon Request's Maternity Concierge Jessica Hanson works with a customer in the program. Photo provided by Best Upon Request. PICTURED: Scooter Media owner Shannan Boyer and her employees benefitting from the baby in the office. Photos provided by Boyer. Talent & Leadership Development In order to ensure our region will continue to develop, attract and retain talent, the NKY Chamber continues to focus on programs which are connected to enhancing our leadership development and young professional talent. Pictured: RYL 2019 with Newport on the Levee's Assistant General Manager, Justin Otto (LNK 2019). 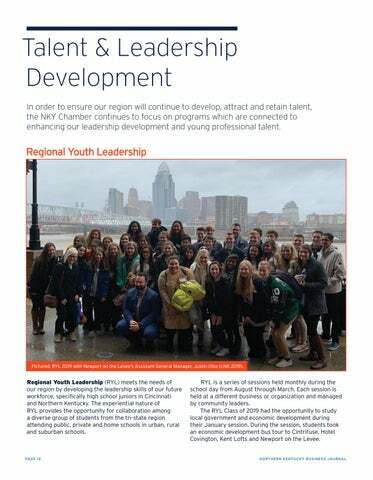 Regional Youth Leadership (RYL) meets the needs of our region by developing the leadership skills of our future workforce, specifically high school juniors in Cincinnati and Northern Kentucky. The experiential nature of RYL provides the opportunity for collaboration among a diverse group of students from the tri-state region attending public, private and home schools in urban, rural and suburban schools. LEADERSHIP UPDATES Northern Kentucky Young Professionals (NKYP) represents the next generation of leaders in our region. As part of the NKY Chamber’s GROW NKY talent initiative, NKYP encourages young leaders who embrace the principles of meaningful participation, effective citizenship and extraordinary imagination to enhance the quality of life and well-being in NKY. In 2019, the NGLA (Next Generation Leader Awards) celebrates 10 years of recognizing YPs under the age of 40 for significant professional accomplishments, demonstrated leadership, and community impact. Hosted by NKYP, the celebration will honor selected finalists in ten industry categories on Thursday, July 18 at the Newport Aquarium. Want to get involved or have YPs in your company that are looking for ways to be engaged at the NKY Chamber? The NKYP Passport is an all-access pass available to young professionals that offers an annual flat fee to attend all NKYP events, opportunities to serve on NKYP planning committees, and discounts and exclusive invites to select NKY Chamber and community events. 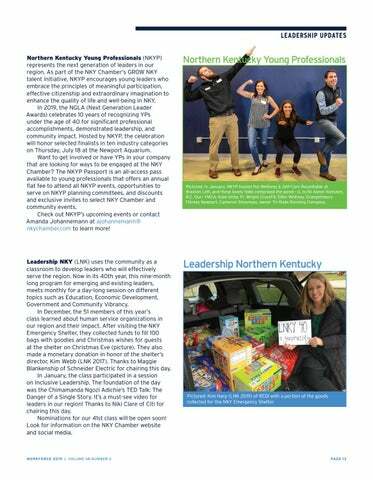 Check out NKYP’s upcoming events or contact Amanda Johannemann at ajohannemann@ nkychamber.com to learn more! Leadership NKY (LNK) uses the community as a classroom to develop leaders who will effectively serve the region. Now in its 40th year, this nine-month long program for emerging and existing leaders, meets monthly for a day-long session on different topics such as Education, Economic Development, Government and Community Vibrancy. In December, the 51 members of this year’s class learned about human service organizations in our region and their impact. After visiting the NKY Emergency Shelter, they collected funds to fill 100 bags with goodies and Christmas wishes for guests at the shelter on Christmas Eve (picture). They also made a monetary donation in honor of the shelter’s director, Kim Webb (LNK 2017). Thanks to Maggie Blankenship of Schneider Electric for chairing this day. In January, the class participated in a session on Inclusive Leadership. The foundation of the day was the Chimamanda Ngozi Adichie’s TED Talk: The Danger of a Single Story. It’s a must-see video for leaders in our region! Thanks to Niki Clare of Citi for chairing this day. Nominations for our 41st class will be open soon! Look for information on the NKY Chamber website and social media. Pictured: In January, NKYP hosted the Wellness & Self-Care Roundtable at Braxton Loft, and these lovely folks comprised the panel - (L to R) Aaron Hanseen, R.C. Durr YMCA; Kate Grise, Ft. Wright CrossFit; Ellen Whitney, Orangetheory Fitness Newport; Cameron Simoneau, owner Tri-State Running Company. Pictured: Kim Harp (LNK 2019) of REDI with a portion of the goods collected for the NKY Emergency Shelter. to Commercial Banking focused on you. You can count on Civista Bank to bring creative, customized solutions and prompt answers to your business needs. As leaders active in your community, our experienced commercial bankers are focused on your companyâ&#x20AC;&#x2122;s ongoing success and the growth of the communities we call home. Whether you want to finance a development project or business expansion, purchase new inventory or cover unexpected expenses, our primary goal is to help you achieve yours. Committed to keeping you well-connected. Mark your calendars for the biggest night of the year. Charter is proud to be a part of Northern Kentucky Chamber Day in Frankfort. Planning for an Intern Excerpts from the Cincinnati Region Internship Toolkit IN AN UNPRECEDENTED AND FIRST OF ITS KIND EFFORT, HIGHER education and employers in the Cincinnati region are sharing information, connections and resources. Led by the Greater Cincinnati Collegiate Connection (GC3), Cincinnati USA Regional Chamber and Northern Kentucky Chamber of Commerce, in collaboration with leaders from 18 colleges and universities in the Cincinnati region; this team of experts is known as the Cincinnati Region Internship Taskforce. The taskforce came together throughout 2018 to address talent issues from area businesses and help employers improve their talent pipeline. 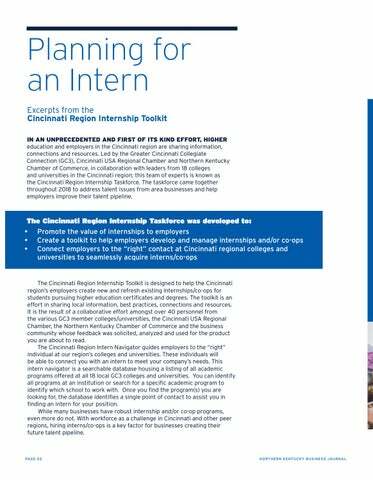 The Cincinnati Region Internship Toolkit is designed to help the Cincinnati region’s employers create new and refresh existing internships/co-ops for students pursuing higher education certificates and degrees. The toolkit is an effort in sharing local information, best practices, connections and resources. 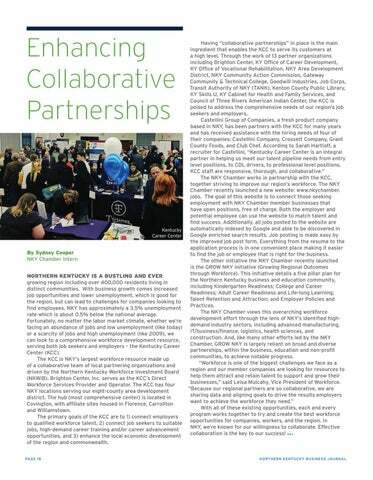 It is the result of a collaborative effort amongst over 40 personnel from the various GC3 member colleges/universities, the Cincinnati USA Regional Chamber, the Northern Kentucky Chamber of Commerce and the business community whose feedback was solicited, analyzed and used for the product you are about to read. 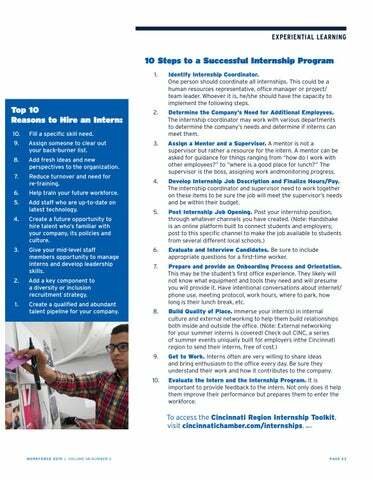 The Cincinnati Region Intern Navigator guides employers to the “right” individual at our region’s colleges and universities. These individuals will be able to connect you with an intern to meet your company’s needs. This intern navigator is a searchable database housing a listing of all academic programs offered at all 18 local GC3 colleges and universities. You can identify all programs at an institution or search for a specific academic program to identify which school to work with. Once you find the program(s) you are looking for, the database identifies a single point of contact to assist you in finding an intern for your position. While many businesses have robust internship and/or co-op programs, even more do not. With workforce as a challenge in Cincinnati and other peer regions, hiring interns/co-ops is a key factor for businesses creating their future talent pipeline. Top 10 Reasons to Hire an Intern: 10. Fill a specific skill need. Assign someone to clear out your back-burner list. Add fresh ideas and new perspectives to the organization. Reduce turnover and need for re-training. Help train your future workforce. Add staff who are up-to-date on latest technology. Create a future opportunity to hire talent who’s familiar with your company, its policies and culture. Give your mid-level staff members opportunity to manage interns and develop leadership skills. Add a key component to a diversity or inclusion recruitment strategy. Create a qualified and abundant talent pipeline for your company. Identify Internship Coordinator. One person should coordinate all internships. This could be a human resources representative, office manager or project/ team leader. Whoever it is, he/she should have the capacity to implement the following steps. Determine the Company’s Need for Additional Employees. The internship coordinator may work with various departments to determine the company’s needs and determine if interns can meet them. Assign a Mentor and a Supervisor. A mentor is not a supervisor but rather a resource for the intern. A mentor can be asked for guidance for things ranging from “how do I work with other employees?” to “where is a good place for lunch?” The supervisor is the boss, assigning work andmonitoring progress. Develop Internship Job Description and Finalize Hours/Pay. The internship coordinator and supervisor need to work together on these items to be sure the job will meet the supervisor’s needs and be within their budget. Evaluate and Interview Candidates. Be sure to include appropriate questions for a first-time worker. Prepare and provide an Onboarding Process and Orientation. This may be the student’s first office experience. They likely will not know what equipment and tools they need and will presume you will provide it. Have intentional conversations about internet/ phone use, meeting protocol, work hours, where to park, how long is their lunch break, etc. Get to Work. Interns often are very willing to share ideas and bring enthusiasm to the office every day. Be sure they understand their work and how it contributes to the company. Evaluate the Intern and the Internship Program. It is important to provide feedback to the intern. Not only does it help them improve their performance but prepares them to enter the workforce. A 2015 STUDY BY DELOITTE FOUND THAT CULTURE AND EMPLOYEE engagement was recognized as the most important workforce challenge that organizations face among business and HR leaders. With historically low unemployment rates, the competition for talent is extremely tight and has pushed organizations to take a closer look at how they cultivate, manage, and measure employee engagement in their workforce. Leaders from four local companies who have been ahead of the curve on developing programs designed to improve engagement and retention by fostering a positive and meaningful workplace environment shared their experiences. PICTURED: Dave Spaulding and Turner employees on Turner's annual community improvement day, Paint the Town Blue. Photo provided by Turner. Dave Spaulding, Vice President at Turner Construction, is unequivocal in his commitment to creating a strong work culture. “We don't just want to be the best construction company, we want to be the best place to work,” Spaulding said. Turner has the accolades that prove their efforts are working and being recognized. The Human Rights Campaign has recognized Turner as a leader in promoting LGBTQ workplace equality for the four consecutive years in a row, awarding the company a score of 100/100 on their annual Corporate Equality Index. Additionally, Turner stands by the idea that transparency and open communication from the top down creates a positive culture and returns dividends in the form of employee loyalty. “If communication is good from the top down, it opens up a conduit for communication with the top,” Spaulding said. “Rumors start because people don’t trust that they’re getting all the information. 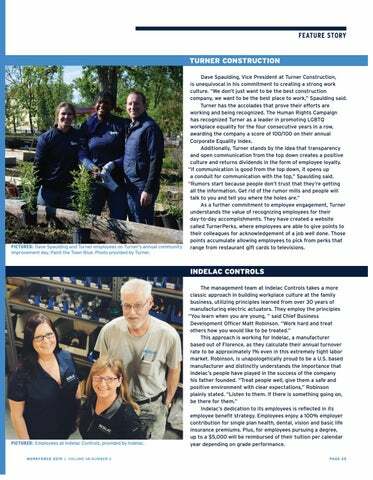 Get rid of the rumor mills and people will talk to you and tell you where the holes are.” As a further commitment to employee engagement, Turner understands the value of recognizing employees for their day-to-day accomplishments. They have created a website called TurnerPerks, where employees are able to give points to their colleagues for acknowledgement of a job well done. Those points accumulate allowing employees to pick from perks that range from restaurant gift cards to televisions. But the employee perks are just the shiny surface of Rudler’s purposeful workplace culture. Look a little deeper and you will see a thoughtful and focused effort to foster open communication, develop young talent, and provide an environment where employees feel valued. For example, all new employees are assigned a mentor to help get them started and encourage their continued professional growth. All employees get an opportunity to work with HR, Rudler leadership, and their mentor to develop a Personal Learning Plan specific to their unique career goals. These plans help determine which projects employees might work on to gain the skills and experience they need to get where they want to go professionally. To keep employees informed about the achievement of the firm as a whole, the leadership puts together a “State of the Firm” event semiannually. “We give staff an inside look into the firm,” Weidner said. “We talk about gross revenue, how we did, and how much we’re spending on technology.” Training staff to think strategically for their clients instead of merely plugging numbers into the right spots is crucial for Rudler because, as Weidner noted, “Five years from now, tax returns are going to be all automated.” To that end, Rudler has created a monthly lunch-n-learn series for their staff where they cover various strategic topics, such as business entity selection and business interruption insurance, sometimes bringing in outside speakers. Look a little deeper and you will see a thoughtful and focused effort to foster open communication, develop young talent, and provide an environment where employees feel valued. PICTURED: Rudler employees taking time out for a mini golf contest, provided by Rudler. The TiER1 Academy prescribes employees a series of experiences that new employees should go through during their first week, month, or year as an employee. For example, read a specific article and then have a conversation with a coworker about how the content fits with TiER1 mission and values. PICTURED: Turner employees on Turner's annual community improvement day, Paint the Town Blue, photo provided by Turner. Open and transparent communication from the top down that encourages and fosters communications from the bottom up. Employee compensation must be competitive and innovative benefits are helpful, however, what is most important in creating a strong culture is how employees are treated. Focusing on your people, creating growth opportunities, recognizing them when they excel, and generally making an intentional effort to build an environment where people feel valued. 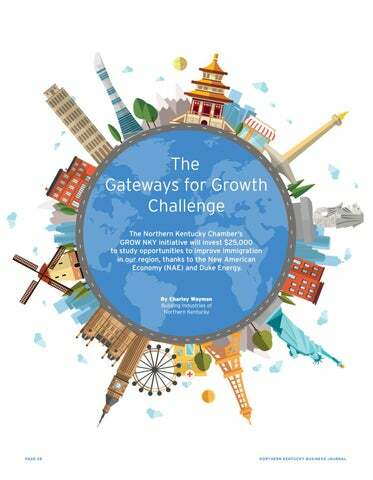 The Gateways for Growth Challenge The Northern Kentucky Chamber's GROW NKY initiative will invest $25,000 to study opportunities to improve immigration in our region, thanks to the New American Economy (NAE) and Duke Energy. WHEN THE GROW NKY INITIATIVE FIRST convened in mid 2017, local leaders identified that talent attraction and retention was one of five key workforce pillars for continued growth. Communities that are experiencing population growth have learned to welcome and integrate new Americans through collaborations between local government and local businesses, resulting in inclusive and vibrant economies. Leaders discussed how immigration in the United States is changing local demographics. Regional colleges and universities are bringing many multi-cultural students to the NKY region, but they tend to leave after graduation, choosing to move to other locations that are more “welcoming” of immigrants or to return home. “Our businesses need employees,” said Leisa Mulcahy, Vice President of Workforce with the NKY Chamber. “They also want a community of innovation. To facilitate that, it is important to have different ideas and experiences around the table. When we lose the international talent brought to us by the local colleges and universities, this negatively affects our opportunities for growth, not in the number of employable people, but also employees who bring diversity in ideas, backgrounds, and experiences that support innovation.” Current federal immigration policy puts communities in a weak position for making immigrant residents feel welcome and protected, communities face further challenges as they try to meet the needs of a diverse population. The recent federal government shutdown further adds to the issue of immigrants feeling left out of the conversation at a local and national level. The NKY Chamber recognizes communities must work together to create environments that are inclusive, showcase the contribution of all residents, and provide the population with key resources to promote growth in today’s workforce. The Gateways for Growth Challenge Grant will support the creation of a multi-sector plan for welcoming and integrating immigrants into Boone, Campbell, and Kenton counties. “So much of what we have done around workforce has been anecdotal in nature, but it would be so refreshing to have a community plan around integration supported by both data and community leadership at large,” Mulcahy added. 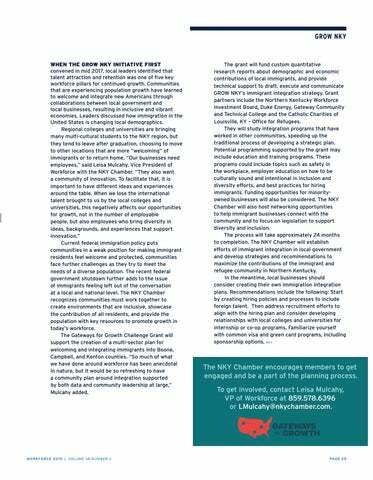 The NKY Chamber encourages members to get engaged and be a part of the planning process. 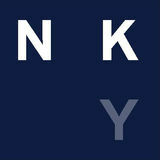 To get involved, contact Leisa Mulcahy, VP of Workforce at 859.578.6396 or LMulcahy@nkychamber.com. WEALTH MANAGEMENT FIRMS AND ADVISORS INVEST a considerable amount of time forecasting the financial future. Unlike meteorologists with their eye on the next few days, investment managers and financial planners look years, even decades, ahead. That’s what it takes to plan for our clients’ ever-changing needs. A similar future-focus is critical when it comes to the preparation and management of your business, too. Any business should plan now to ensure a smooth transition of management in the years ahead. An important step in preparing for the future is the concept of “mentoring up.” This practice gives the next generation of leaders in your company the opportunity to develop leadership skills with real-world knowledge and guidance while at the same time sharing their expertise with senior team members. WHAT IS “MENTORING UP?” You’ve probably heard of different types of mentoring, including the more traditional method of mentoring down and peer mentoring. The idea of “mentoring up” allows mentees to take an active role in their mentoring relationships by shifting the emphasis from the mentor having the responsibility of sharing knowledge to equal emphasis on both mentor and mentee contributing to the relationship. Instead of a one-way street, the contributions flow both ways. This provides the mentor with new perspectives and insights into growth areas they may not be proficient in already. Both parties come to the table with their own expertise, expectations, and ideas; and together they work to solidify and achieve their goals. Part of mentoring up calls for mentees to assess what they need from their mentors, and to clarify these expectations. Mentees should recognize that one mentor does not need to check every box for them. You may have different mentors who provide guidance on specific areas of your professional or personal life. Perhaps one person is an expert on sales, while another is more focused on operational improvements. The other key aspect of mentoring up requires the mentee to add their own value to the relationship. This may be as simple as having the time to work on special projects or it could mean a specialized knowledge set that the experienced person is lacking. What the mentee brings to the relationship will change based on that mentor’s needs. It may be a technical expertise, such as digital marketing; or it could be a new perspective, such as how to engage younger personnel in the workforce. Agreement on what’s expected from the relationship improves the odds for more productive collaboration and less confusion. 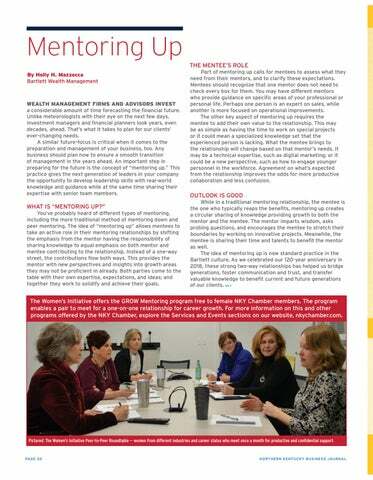 The Women’s Initiative offers the GROW Mentoring program free to female NKY Chamber members. The program enables a pair to meet for a one-on-one relationship for career growth. For more information on this and other programs offered by the NKY Chamber, explore the Services and Events sections on our website, nkychamber.com. Pictured: The Women's Initiative Peer-to-Peer Roundtable — women from different industries and career status who meet once a month for productive and confidential support. 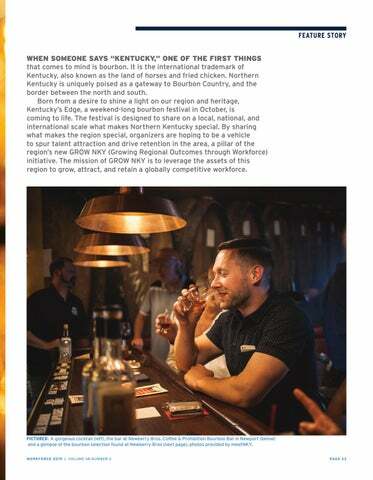 FEATURE STORY WHEN SOMEONE SAYS “KENTUCKY,” ONE OF THE FIRST THINGS that comes to mind is bourbon. It is the international trademark of Kentucky, also known as the land of horses and fried chicken. Northern Kentucky is uniquely poised as a gateway to Bourbon Country, and the border between the north and south. Born from a desire to shine a light on our region and heritage, Kentucky’s Edge, a weekend-long bourbon festival in October, is coming to life. The festival is designed to share on a local, national, and international scale what makes Northern Kentucky special. By sharing what makes the region special, organizers are hoping to be a vehicle to spur talent attraction and drive retention in the area, a pillar of the region’s new GROW NKY (Growing Regional Outcomes through Workforce) initiative. The mission of GROW NKY is to leverage the assets of this region to grow, attract, and retain a globally competitive workforce. “It’s no coincidence that this festival follows Brandemonium,” continued Donabedian. “We want to highlight what Cincinnati does best and what Northern Kentucky does best. The two regions border each other and feed off of each other. It’s natural that these events would coincide.” The event’s campus will be Northern Kentucky’s River Cities and will feature a wide variety of paid and free events, including a free music festival on the banks of the Ohio River. Bourbon connoisseurs of all levels will be able to find something to enjoy. Local bars will host bourbon tastings and pairings, musical acts will perform at venues throughout the region, and the highlight of the weekend will be the conference at the NKY Convention Center on Saturday, October 5. All are welcome whether bourbon expert or novice. “We want everyone to come and participate in this event,” said Donabedian. “We’re celebrating bourbon, Northern Kentucky, and what makes this region special. 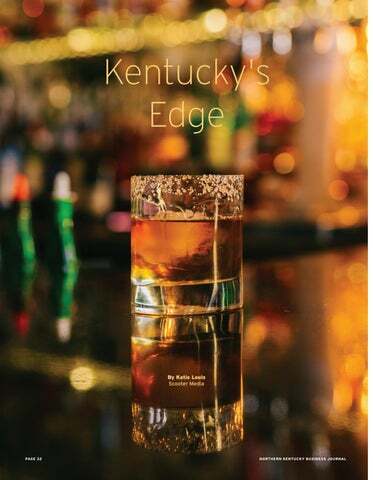 There will be a lot of things to do that weekend, so you can immerse yourself in bourbon as much or as little as you want.” The main event of Kentucky’s Edge is, of course, the bourbon. But the event is also meant to celebrate Kentucky’s heritage and culture as a whole. There will be an Artisanal Kentucky Market in Mainstrasse Village in Covington where musicians will be from Kentucky or play music from Kentucky. More details will emerge in the coming months. The latest information about Kentucky’s Edge, tickets, and sponsorships is available online at KentuckysEdge.com. PICTURED: 1. Bill Donabedian, Brent Cooper & Kevin Canafax 2. Jacob Brooks, Taylor Cook, Aaron Hanseen & Jack Estael 3. Lauren Vogel & Mikayla Williams 4. The CONNECT Hour crew at Loftus Total Skin Care All photos by Ben Gastright, unless otherwise noted. We’re known for helping people open doors all over town. SCORE’S volunteer business professionals support the success of small business owners throughout the tri-state. We have the expertise you need whether you’re opening your doors for the first time or have been keeping them open for years. Through mentoring and education, we help you solve the daily challenges and keep the big picture in focus. Go to our website and sign up for a mentor - you’ll build relationships that help you walk through the door to success. LET US HELP YOU PROMOTE! We want to help you promote and celebrate your ribbon cutting ceremony for your new facility, expansion, anniversary celebration or open house! Weâ&#x20AC;&#x2122;ll bring our trademark giant blue scissors, a group of Chamber ambassadors, and a camera to capture the excitement of your special day. Call Lynn Abeln at (859) 578-6390 to schedule your FREE ribbon cutting today! Erigo Employer Solutions is pleased to announce the promotion of Megan O’Brien, SHRM-CP to COO/CHRO. Shortly after the company's founding, she joined the Erigo team in 2012 as an HR Assistant and moved her way through various HR roles prior to being promoted to HR Director in 2017. In her new role, O'Brien will be responsible for overseeing Erigo's human resources and payroll services and streamlining business operations to ensure that outstanding client experiences are delivered. First Financial proudly announces Jacob Holbrook as the new market president for the Northern Kentucky region. “I’m excited to be part such an outstanding, hometown company that is truly focused on delivering innovative solutions and making a difference in the community,” said Holbrook. “As a young boy, I would join my grandfather, the president of a small community bank, as he visited clients. He wanted nothing more than to support Northern Kentucky and see the community succeed. He inspired me on my own career journey and I’m proud to carry on his legacy. I’m excited to work with local residents and businesses to help shape the future of our region.” Holbrook, a seasoned banking leader, joins First Financial with more than 15 years of experience. He is a graduate of the College of Mount Saint Joseph. Prior to joining First Financial, he worked for U.S. Bank as vice president of commercial banking and held leadership positions with Huntington Bank and Key Bank. Holbrook is an active member of the community and currently serves as a member of the Campbell County Leadership Action Group, The Catalytic Fund of Northern Kentucky, Alliance for Catholic Urban Education (ACUE)-Diocese of Covington, Leadership Northern Kentucky, Children Inc., and the Northern Kentucky Chamber of Commerce. He also serves as a youth coach in Campbell County. Rudler, PSC was recently recognized as an honoree of the 2019 Medical Mutual Greater Cincinnati Pillar Awards for Community Service presented by Medical Mutual and hosted by Smart Business. The firm is passionate about giving back to the community and honored to be recognized for this award. Rudler is excited to be celebrating 50 years of business in 2019. Rudler was founded by Don Rudler from the basement of his home in 1969. Today, the firm has more than 40 employees and continues to grow. Rudler has been ranked nationally as a “Best Accounting Firm to Work For” by Accounting Today for multiple years. Rudler’s unique culture, desire to stay ahead of technological advances in the field and strong client relationships have helped them reach this milestone. Rudler would like to thank our clients and staff for an incredible 50 years – here’s to 50 more! — SHARE YOUR GOOD NEWS! 72 YEARS OF SERVING KENTUCKY. Born from a desire to shine a light on our region and heritage, Kentucky’s Edge, a weekend-long bourbon festival in October, is coming to life. The festival is designed to share on a local, national, and international scale what makes Northern Kentucky special. By sharing what makes the region special, organizers are hoping to be a vehicle to spur talent attraction and drive retention in the area. An important step in preparing for the future is the concept of “mentoring up.” This practice gives the next generation of leaders in your company the opportunity to develop leadership skills with real-world knowledge and guidance while at the same time sharing their expertise with senior team members. When the GROW NKY initiative first convened in mid 2017, local leaders identified that talent attraction and retention was one of five key workforce pillars for continued growth. Communities that are experiencing population growth have learned to welcome and integrate new Americans through collaborations between local government and local businesses, resulting in inclusive and vibrant economies. Leaders discussed how immigration in the United States is changing local demographics. With historically low unemployment rates, the competition for talent is extremely tight and has pushed organizations to take a closer look at how they cultivate, manage, and measure employee engagement in their workforce. Leaders from four local companies who have been ahead of the curve on developing programs designed to improve engagement and retention by fostering a positive and meaningful workplace environment shared their experiences. NKY has approximately a 3.5% unemployment rate which is about 0.5% below the national average. Fortunately, no matter the labor market climate, whether we’re facing an abundance of jobs and low unemployment (like today) or a scarcity of jobs and high unemployment (like 2009), we can look to a comprehensive workforce development resource, serving both job seekers and employers – the Kentucky Career Center (KCC). The broader region is poised for continued success when it comes to job growth and expanded economic impact. The ability to reach our full potential as a region hinges on access to jobs and opportunities for people across the Tri-State. 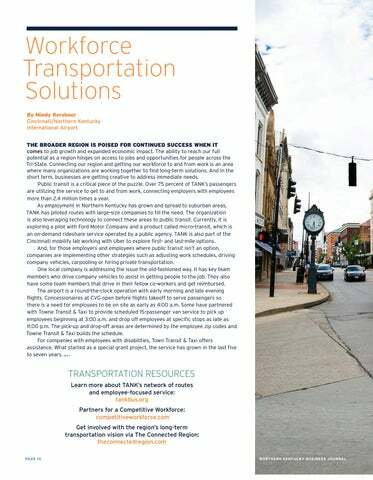 Connecting our region and getting our workforce to and from work is an area where many organizations are working together to find long-term solutions. And in the short term, businesses are getting creative to address immediate needs. In order to ensure our region will continue to develop, attract and retain talent, the NKY Chamber continues to focus on programs which are connected to enhancing our leadership development and young professional talent.